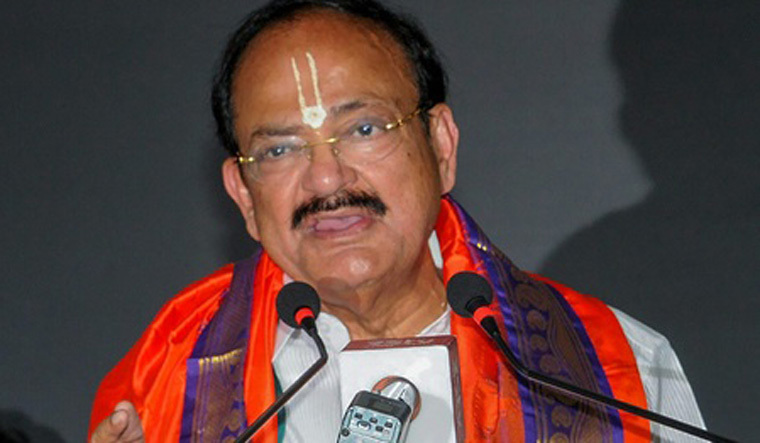 Under attack over his decision on rejecting the impeachment motion against the Chief Justice of India, Rajya Sabha Chairman M. Venkaiah Naidu, on Tuesday, said the decision came after over a month of due diligence, and was not done in haste. The decision was also in strict conformity with the provisions of the Constitution and the Judges Inquiry Act of 1968, he told a delegation of ten lawyers of Supreme Court, who met him to compliment him on the order, sources said. On Monday, the chairman rejected the notice of the motion signed by 64 MPs ,seeking impeachment of Chief Justice Dipak Mishra on five charges of misbehaviour. He found the allegations were unverifiable and could not be acted upon. Congress leader and former law minister Kapil Sibal, one of the signatories to the notice, on Monday attacked Naidu's decision as "illegal, wrong and unconstitutional", and "taken in haste". He also said that the MPs will challenge the order in the Supreme Court. The lawyers said the chairman's decision in time has saved the dignity of the office of Chief Justice Of India and the apex court. "I don't think it warrants compliments as I only did what was expected of me and in the manner the chairman of Rajya Sabha was expected to conduct in such matters. Some hon'ble members of the house had a point of view and the right to express it while I had a responsibility cast on me. I have done my job and am satisfied with it," Naidu said. In an apparent reference to the criticism that he had taken the decision in a haste within three days of the impeachment notice given to him, the chairman referred to the media reports for over a month about moving a notice against the Chief Justice of India and said, "I have since been working on the provisions, procedures and precedents in the matter given the serious nature of the proposal and its implications and the imperative need for a timely decision." The lawyers said this was not the first case of such a notice being rejected by a presiding officer. They referred to a similar notice against Supreme Court Judge J.C. Shah rejected by the then Lok Sabha speaker G.S. Dhillon and Justice Shah later becoming the Chief Justice of India. They also recalled that a notice for removal of Justice P.D. Dinakaran was admitted within three days. The chairman said Section 3 of the The Judges Inquiry Act clearly required the Chairman of Rajya Sabha to look for prima facie in the matter for either admitting the notice or refusing to do so. A clear responsibility was cast on the chairman in this regard and it would not be correct to interpret the role of chairman as that of a mere post office. The chairman is required to act as a constitutional functionary which is a substantial responsibility. The relevant sections says: "The chairman may, after consulting such persons, if any, as he thinks fit and after considering such materials, if any, as may be available to him, either admit the motion or refuse to admit the same". Naidu referred to adverse consequences of constitutional functionaries not acting in time as in the case of defections in some states, resulting in subversion of the spirit of the laws. He said Chief Justice of India is the highest judicial functionary of the country and any issue in public domain concerning him requires to be resolved at the earliest following prescribed procedures so as to prevent the atmosphere from being further vitiated. Issues raised in the notice mostly pertained to the functioning of the Supreme Court and they have to be resolved internally, he said, adding that any other means of seeking to address them amounts to interference in the independence of judiciary. During the discussion, some lawyers referred to earlier media reports urging the chairman not to sit over inordinately whenever the notice was given and some now saying the decision was hasty. Naidu responded, saying: "Freedom of expression allows that but ultimately truth prevails. I have done the just thing in the best possible manner expected of me."